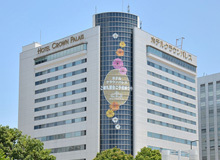 Hotel Crown Palais Hamamatsu is located 3 minutes walk from JR Hamamatsu Station with exquisite appearance. Excellent atmosphere, high-quality hospitality and service will ensure guests' refreshment and relaxation. © 2019 Hotel Crown Palais Hamamatsu All rights reserved.